Wear Green Day - Wednesday, November 9th: Most people have something green in their closet; whether it be a t-shirt, tie, pair of socks, etc. Coordinate a "Wear Green" day with your coworkers, friends, students, and/or classmates on November 9th. This is a fun and easy way to encourage people to learn more about NRPM. 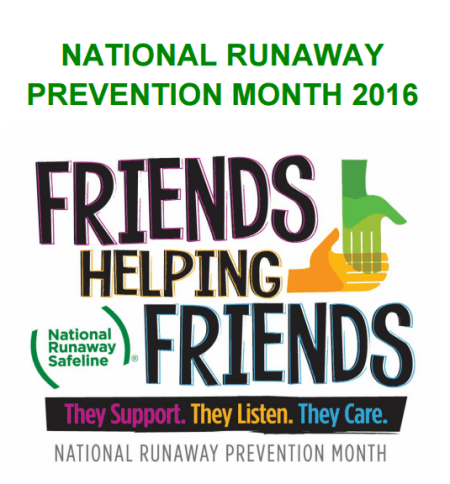 For added impact, take a photo of your group wearing green and post it to social media using the hashtag #NRPM2016. Tag NRS and they'll share your photo. National Candlelight Vigil - Wednesday, November 16th: Youth Service agencies, community groups, and individuals will host candlelight vigils to show solidarity with youth in crisis. Host your own candlelight vigil in your neighborhood, at your school, your workplace, your place of worship, etc. This event is low cost and high impact. Selfie Sign Day - Wednesday, November 23rd: On this day, NRS' website, www.1800runaway.org, will have a "Selfie Sign" available for individuals to download. The sign will show you are supporting NRPM 2016, but they're also encouraging everyone to use the caption, "This is how I have helped a friend..." and have everyone share a story about how they've helped a friend. let your flames burn brightly to guide us "home."